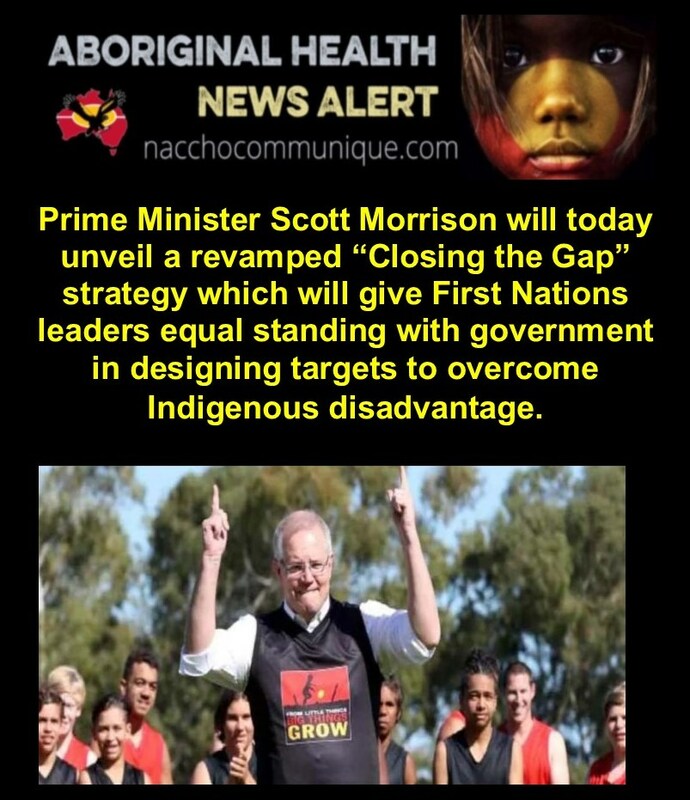 NACCHO Aboriginal Health and #RefreshTheCTGRefresh : Prime Minister Scott Morrison will today unveil a revamped #ClosingtheGap strategy which will give First Nations leaders equal standing with government in designing targets to overcome Indigenous disadvantage. Prime Minister Scott Morrison will today unveil a revamped “Closing the Gap” strategy which will give First Nations leaders equal standing with government in designing targets to overcome Indigenous disadvantage. Mr Morrison is expected to tell Parliament that the decade-old framework used by federal and state governments to “close the gap” had been well-intentioned, but “doomed to fail” because it did not sufficiently share “objective and process” with Indigenous Australians and did not hold different levels of government to account. He will say previous targets have been too narrow, sometimes with counterproductive effect. “The very nature of looking at this from a ‘closing the gap’ point of view takes a deficit mentality to the task which can sometimes mask progress being made,” Mr Morrison will say. The 11th Closing the Gap report to Parliament is expected to show that the targets set in 2008 have “by and large” not been met, though there is some positive news. * Early education: 95 per cent of all indigenous four-year-olds enrolled in early childhood education by 2025. ON TRACK. * Year 12 attainment: Halve the gap in Year 12 attainment by 2020. ON TRACK. * Life expectancy: Close the gap in life expectancy between indigenous and non-indigenous Australians within a generation by 2031. NOT ON TRACK. Progress towards meeting two of seven goals – for getting more Indigenous children into early childhood education and for halving the year 12 attainment gap – are on track, but progress on five others are not. Closing the gap in life expectancy between Indigenous and non-Indigenous Australians by 2031 is not on track, nor is a halving of the gap in child mortality rates by 2018, halving the employment gap, halving the gap in reading and numeracy for Indigenous students and closing the gap in school attendance. On reading and numeracy, results are mixed. The share of Indigenous students meeting national minimum standards in years 3 and 5 reading, and years 5 and 9 numeracy, increased by around 11 to 13 percentage points. But only year 9 numeracy was on track in all states. The Indigenous child mortality rate has declined by 10 per cent but the gap has not narrowed, as the non-Indigenous rate has declined even faster. Just over half the Indigenous Australians of working age living in major cities were employed, while in remote areas the figure was as low as 31 per cent. New targets are expected to be more evidence-based and “strike the balance between ambition and what is achievable”, Mr Morrison is expected to say. The government also wants to see a pivot towards increasing opportunities for economic development, not reflected in the current closing the gap framework. 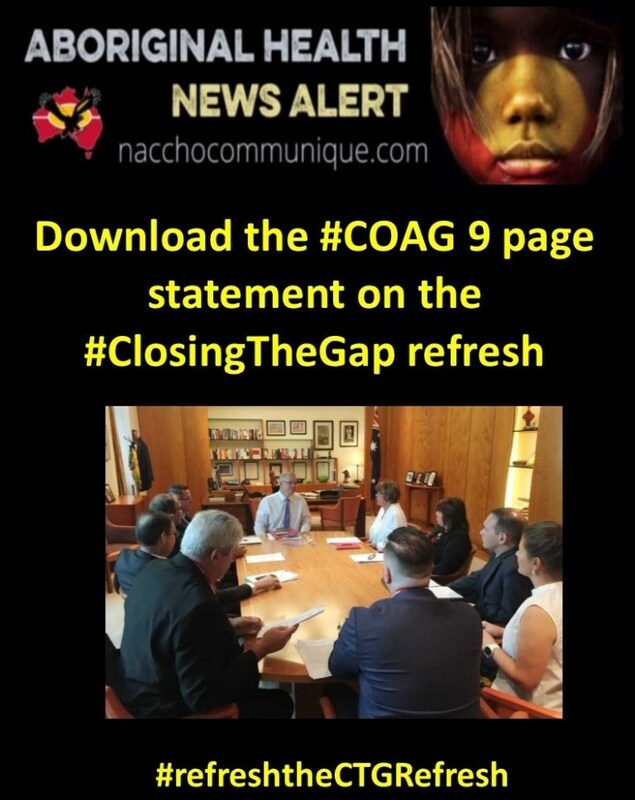 The fresh approach to Closing the Gap builds on work under way since 2017, when the Council of Australian Governments (COAG) agreed to a “refresh” of the strategy, in line with calls from Indigenous leaders for a greater role in deciding and designing the targets. In the run-up to the last COAG meeting in November, the head of the National Aboriginal Community Controlled Health Organisation, Pat Turner, called for Aboriginal bodies to be given “full partnership” in the process. However for many Indigenous leaders, a top priority is achieving a First Nations “Voice” to be embedded in the Constitution, in line with the historic 2017 Uluru Statement from the Heart. Labor has promised a referendum on the issue in its first term if elected, while the Coalition remains wary of the move, saying it runs the risk of becoming a “third chamber” of Parliament. Efforts to close the health and education gap for indigenous Australians will be revised and broadened to get more input from the people they’re meant to help. Prime Minister Scott Morrison will deliver the 11th annual Closing the Gap report today , detailing proposed changes to how it works. The report shows efforts to get more indigenous children into early education are on track, but improving life expectancy, infant mortality and employment status were not. Mr Morrison will say the targets need to be revised to make states and territories more accountable, and give indigenous Australians more ownership of them. “The Closing the Gap targets have been well intentioned but ‘top down’, so it was always doomed to fail in both its ambitions and also its process,” Mr Morrison will say on Thursday. Mr Morrison says the current way of measuring the targets masks progress, discouraging further efforts. For instance, child mortality among indigenous Australians has decreased 10 per cent since 2008 – but the target is not on track because the non-indigenous figure has declined at a faster rate. The “refresh” of the Closing the Gap targets, announced in 2016, will ask indigenous Australians to develop the targets. It will also hold different levels of government to account, and include new priorities on housing, employment, family violence and land and water rights.